Ron A. Sebastian is a Northwest Coast Native Artist. He holds a name, GWIN BUTSXW (Likes-to-be-Packed) in the House of Spookw, Lak Gibuu (Wolf) Clan. One side of Ron's family is Gitksan and the other side is Wet'suwet'en. He was born in 1945 on a Fishpacker that was taking his mother from Carlisle to Prince Rupert, on the British Columbia Coast. Ron was raised in the Wet'suwet'en village of Hagwilget, where he also lives and works today with his wife, Tracy, and their five children. His uncle, Joe Sebastian, taught Ron the principles of carving totem poles and masks. In the early 1970's Ron studied carving and design at the Gitanmaax School of Northwest Coast Indian Art, at 'Ksan Village, Hazelton. In addition to making kerfed boxes and masks, and carving poles, Ron works in gold, silver and sea mammal ivory. His finely crafted jewellery is in high demand both locally and abroad. As well, Ron makes quality silk-screen prints, using bold traditional motifs of the 'Ksan style, often illustrating legends of his people. Ron Sebastian is concerned that Native artists are departing from their traditional designs. He prefers to work in the older styles, depicting regional crest figures. He explains, I never really give out our stories and histories because they belong to the names in our Houses. When someone passes away, the name and the stories are handed down to the nephew or niece of the deceased. In 1977, together with fellow-artist, Earl Muldoe, Ron carved three large murals that are installed in the main foyer of the Department of Indian and Northern Affairs building in Hull, Quebec. 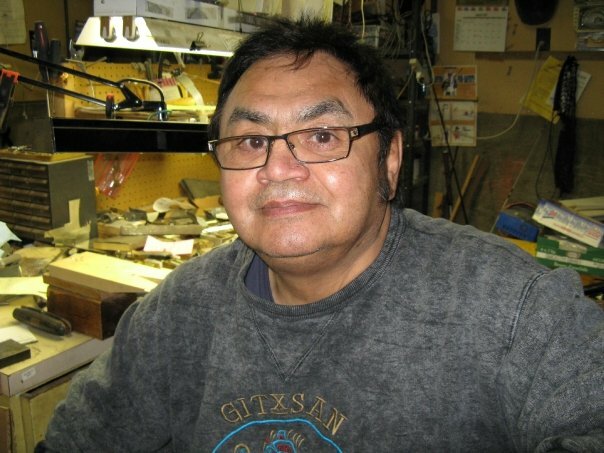 In 1980, together with his brother, Robert, Ron carved a cedar panel for a new school in Takla Landing. Ron’s work is found in museums and private collections in North America, Europe and Japan. His carvings have been widely exhibited and some of his prints have appeared in art books. Ron has carved a 6-ft round mural which can be viewed at the Front entrance to the Smithers Indian Friendship Centre. Of his most elaborate pieces, are two throne type chairs Ron carved for the President and the Chancellor of the University of Northern British Columbia, along with a Talking Stick. Ron continues carving in silver, gold and also wood.